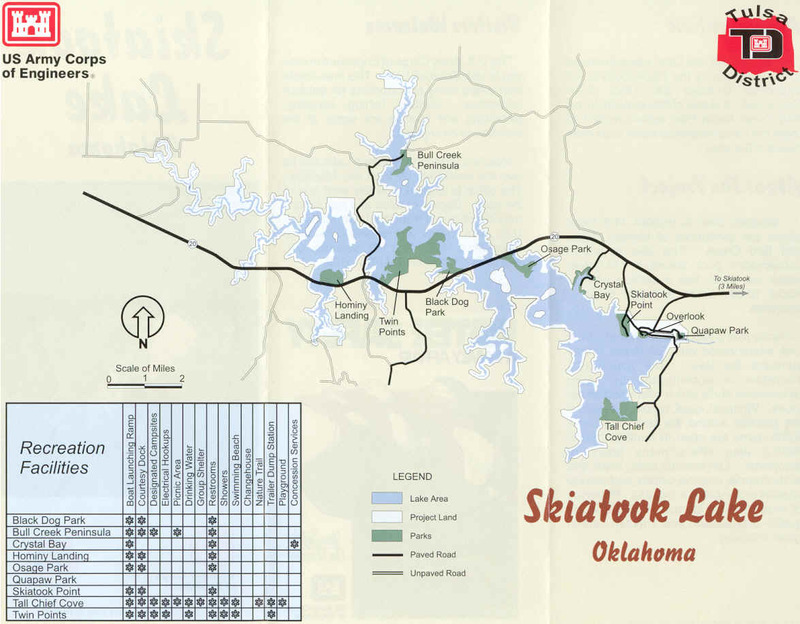 Skiatook Lake is located on Highway 20, 4 miles west of the town of Skiatook, and 11 miles east of Hominy, Oklahoma; about a one hour drive from Tulsa. Gentle rolling hills of Blackjack and Post Oak interspersed with Tall Grass Prairie surround beautiful Skiatook Lake. Elevated 714.0 feet above sea level, the lake has a surface area of about 10,500 acres and 160 miles of shoreline. The shoreline is accentuated by steep picturesque bluffs which offer fantastic views. Boating, hiking, swimming, camping, picnicking, as well as hunting and fishing are all popular activities at the lake. Sport fishing is very popular and Skiatook Lake has several annual fishing tournaments. Largemouth bass, black and white crappie, channel catfish, and several species of sunfish, or lake perch are plentiful in Skiatook Lake. (For more information about the Fishing Tournaments, contact the Skiatook Chamber). Whitetail deer, rabbit, squirrel, quail, and many more bird species are plentiful around the lake. Even a few coyote have been seen. During the seasons, about 8,000 acres of this land are open for hunting. About 1,800 acres of land around the lake have been set aside for public use areas. These areas provide roads, parking spaces, boat ramps, nature trails, picnicking, and camping sites along with sanitary facilities. These areas remain attractive to the user and blend in with the natural landscape surrounding the lake. Cross Timbers Marina/Resort: Featuring over 450 slips on beautiful Skiatook Lake located 20 minutes from downtown Tulsa, Cross Timbers Marina on Skiatook Lake is quickly becoming the area's preferred choice for quality, convenience and fun. The lake's water quality is unequalled in NE Oklahoma, and its 168 miles of unspoiled shoreline is yours to explore. Hominy creek is the principal tributary of Bird Creek which enters the Verdigris River immediately downstream from the Port of Catoosa. The main tributaries of Hominy Creek in the project area are Tall Chief, Turkey, Goiuin, Bull, Wildhorse, Boar, Sand, and Mahala Creeks. Skiatook Lake assists in providing flood protection on Bird Creek below the mouth of Hominy Creek. Protection in this reach is also shared by Birch Lake, which is located on an upstream tributary of Bird Creek. Downstream from Skiatook Lake, about 100,000 acres of land in the flood plain of Hominy Creek, Bird Creek, and the Verdigris River are affected by the flood control operation of the project. Farming, ranching, oil, and gas production are the principal uses of the land in the basin. Skiatook Dam in located 14.3 miles above the confluence of Hominy Creek and Bird Creek. The project structures consist of an earth embankment dam, an ungated spillway located in a rock cut near the right abutment, outlet works at the right abutment, project building, and overlook structure located at the left abutment near the end of the dam, and public facilites immediately downstream and adjacent to the stilling basin. Skiatook Dam and Lake was authroized for construction by the Flood Control Act approved October 23, 1962 (87th Congress). It is one of five projects in the Bird Creek Basin Plan recommended to meet the comprehensive water resources needs of the area. The Dam site is located on Hominy Creek about 5 miles west of Skiatook in Osage County, Oklahoma. The project serves the purposes of flood control, water quality, water supply, recreation, fish and wildlife management. The total cost of the project was approximately $120 million. The Tulsa District, Corps of Engineers, designed the Skiatook Lake project and supervised its construction. Private contractors were chosen by competitive bidding. Land acquisition for the project began in 1973. Actual construction on the embankment began in May 1977 and was completed in October 1984. The U.S. Army Corps of Engineers invites you to visit Skiatook Lake. Located just four miles west of Skitook, the lake has become well-known as one of the most beautiful lakes in the area. This man-made lake offers many opportunities for outdoor recreation. Hunting, fishing, camping, picnicking, and boating are some of the activities to be enjoyed. Inquiries regarding Skiatook Lake and its use are welcomed by the Lake Manager, and copies of the lake rules and regulations are available also. The office is located near the west end of the dam.